USGS 2008 High Resolution Orthophotography for the Bridgeport, Hartford, and New Haven, Connecticut Urban Areas is an aerial survey of 2008, natural color, leaf off, 1 foot (0.305 meter) ground sample distance imagery from the U.S. Geological Survey for the Bridgeport, Hartford and New Haven, Connecticut Urban Areas. This orthophotography dataset only exists for these three geographic regions. The ground resolution for this imagery is 1 foot (0.305 meter) per image pixel. High Resolution Orthophotography provides a critical tool for those involved in development decisions such as resource managers and city planners. The detailed focus of High Resolution Orthophotography provides emergency responders critical information in determining the best evacuation routes, alternative routes and safe access to aid. High Resolution Orthophotography assists law enforcement personnel in determining the best locations to place surveillance cameras in high-traffic urban areas and popular attractions. A digital orthophotograph is a geometrically accurate photographic record of landscape conditions. As such, the digital orthophotograph is useful for a variety of applications, such as environmental monitoring, facility engineering/maintenance, city/county planning, property line review, etc. The digital orthophoto can be used alone or as a raster basemap for corresponding vector line mapping. The data assists Federal, State and local emergency responders in planning for homeland security efforts. This orthophotography also supports The National Map. This particular aerial survey is ideal for observing features on the ground surface in developed, open or wooded areas because leaves on trees and shrubs that normally obstruct the view from above are largely absent. For example, features such as stone walls, roads, and structures in wooded areas may be observed. Display orthophotography in the background when viewing soils, geologic, hydrologic, and other natural resource information. This mosaic of 2008 urban area orthophotography is not color balanced so tonal imbalances between individual input images are not corrected. The range and intensity of colors varies depending on the area viewed. Also, the location and shape of features in other GIS data may not exactly match information shown in the 2008 aerial photography primarily due to differences in spatial accuracy and data collection dates. 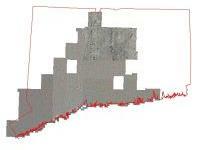 For example, a stream in the 1:24,000-scale Connecticut Hydrography data from CT DEP may not line up exactly with the watercourse shown in the 2008 aerial photography. Their location and shape are bound to be different because information such as hydrography compiled from older 1:24,000-scale USGS topographic quadrangle maps, lacks the spatial accuracy of and is less current than the 2008 orthophotography. Date of Data - Spring 2008. Map Scale and Accuracy - The ground resolution for this imagery is 1 foot (0.305 meter) per image pixel. GIS Metadata - Contains technical documentation describing the 2008 Urban Area Color Orthophotography data and the data sources, process steps, and standards used to collect and store this information in a geographic information system (GIS). USGS 2008 High Resolution Orthoimagery for the Bridgeport, Hartford, and New Haven, Connecticut Urban Area data is available as a statewide mosaic in File Geodatabase format from DEEP GIS Data. Connect GIS and AutoCAD software to this information online using the Ortho 2008 Urban Area Color CT ECO Map Service.